I have never actually divulged how many scarves I own (perhaps I never will). I've collected some in my travels and others for their yummy textures. Knitted, crocheted, woven and sewn - I think I have the whole gamut covered. I found this iron bust form at an antique sale last year near my hometown. It is a small shop only open one weekend a month, so it always a treat to head there to hunt for unique treasures. 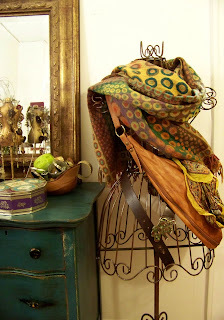 Since finding this gem I have used it to collect scarves and belts in my room - truly functional decor. 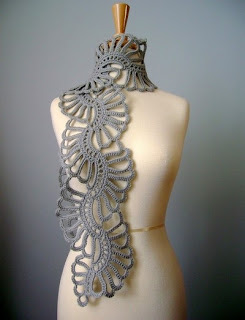 And in the "aspire to make the most badass scarf" category I found this crocheted scarf which absolutely made me drool. Winter project perhaps?